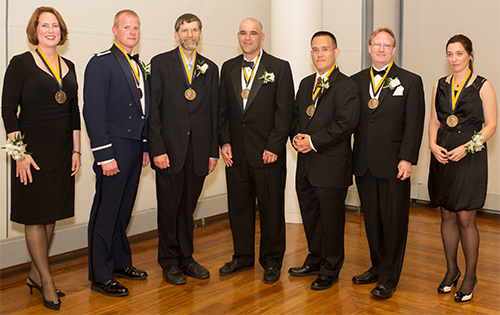 On June 4, 2012, twelve men and women were honored at the 63rd annual Arthur S. Flemming Awards. They included: Dr. Craig Brown, Captain Joshua Burger, Dr. Tucker McElroy, Dr. Nathan Newbury, Dr. Leonard Tender, Dr. Tom Misteli, Dr. Till Rosenband, Dr. Clare Waterman, Regina Galer, Elizabeth Gentry, Dr. Michael Lauer, and Jonathan Kang. Dr. Brown has contributed to our understanding of new materials suited for hydrogen energy storage in next-generation, clean automobiles. His work and findings address one of the largest obstacles in the road to the hydrogen economy, namely the development of safe, practical storage systems that operate at room temperature. Dr. Brown’s ground-breaking research on hydrogen storage through physisorption on high surface area materials recently earned him a Presidential Early Career Award for Scientists and Engineers. He has also contributed significantly to the scientific success of numerous NCNR users as an instrument scientist on the Disk Chopper Spectrometer, the world’s most successful neutron scattering instrument over the last decade. In 2011 Capt Burger was specifically selected as program manager and engineer for the rapid reaction integration and deployment of unmanned surface vehicles equipped with gamma radiation detectors to determine safe stand-off distance for US Navy vessels in response to the nuclear disaster at the Fukushima power plant in Japan. His efforts reduced risk to US Navy vessels and provided a previously unavailable unmanned radiation detection capability to the Navy. The preceding 7 years of his Navy career were marked by significant achievements in leadership of the testing and deployment of a Human Presence Detection System, and resolving safety and landing platform safety issues for Air Force, Army, and Royal Air Force aircraft. Dr. McElroy has developed novel statistical methodologies to address significant problems in seasonal adjustment, forecasting, and time series analysis. Seasonal adjustment takes into account recurring seasonal fluctuations, in areas such as retail sales and employment during holiday periods, which are critical to the evaluation of potential government actions to improve the economy. Internationally recognized, Dr. McElroy’s published achievements on the theory of signal extraction and model misspecification have been implemented in the X-12-ARIMA software program of the Census Bureau which has been used in central banks and statistical agencies around the world. His recent work has improved X-12-ARIMA’s model selection methods and extended it to treat time series data of mingled sampling frequency. Dr. Newbury has invented and applied fiber-laser frequency combs to address some of the world’s most challenging research problems, including subhertz optical spectroscopy, high frequency metrology, nanometer-precision distance ranging, and ultra-high bandwidth communications. He transformed a powerful technology into a practical, turnkey solution with his creation of an entirely new class of frequency combs – the fiber-laser frequency comb. Building on this innovation, he pioneered critically important metrology tools to advance fundamental knowledge in an impressive range of areas – from the dual frequency comb spectroscopy technique for both ultra-high resolution gas detection and dynamic laser characterization, to an ultra-precise laser ranging technique for studying distant objects. His research is being replicated worldwide and contributes to advances in climate change science, precision time-keeping, and semiconductor manufacturing. Dr. Tender is the Department of Defense’s leading science and technology expert in the field of bioelectrochemical systems, processes in which micro-organisms are used to catalyze electrode reactions. While he is recognized worldwide as an expert in the basic science of this field, of particular note here is his pioneering work in applied science and engineering relating to his development of the benthic microbial fuel cell. Benthic microbial fuel cells generate power directly from organic matter residing in marine sediment and are being developed to enable indefinite operation of remotely deployed oceanographic sensors, which are important to the various science agencies of the Department of Defense and the nation. In 2011, Dr. Tender was awarded a US Patent for his demonstration of the benthic microbial fuel cell as a viable technology. Dr. Misteli has pioneered the field of genome cell biology by developing imaging methods to visualize the genome in living cells. His work has led to several important conceptual advances in our fundamental understanding of genome function and has practical application in biomedicine. Dr. Misteli’s methodologies have enabled him to characterize molecular mechanisms involved in the progression of genome cancer, as well as to discover novel human aging mechanisms and to invent a diagnostic strategy for cancer detection based on cell biological properties of the human genome. With the invention of the world’s first “logic clock”, which took less than three years compared to the decade or more required for previous atomic clock development, Dr. Rosenband’s technologies have vastly improved quantum computing research. He has demonstrated the clock as the world’s most accurate atomic clock, with an uncertainty equivalent to one second in 4 billion years and continually improving. Logic clocks can be used for exquisitely sensitive measurements of gravity, motion and other quantities, exploiting the “ticking rate" to make a new class of sensors which in turn can be used in fields as diverse as mineral exploration, inertial navigation, and new ultra-precise measurements of fundamental physics constants. Dr. Waterman is a world-leading expert in basic cell biology research. Using a quantitative microscopy method she invented, known as Fluorescent Speckle Microscopy, she has brought about major advances in our knowledge of how cells self-assemble dynamic, force-generating cytoskeletal and cell adhesion structures that physically drive vertebrate tissue cell migration. The ability of vertebrate cells to move directionally is critical to development, immune response, establishment of the vasculature, tissue maintenance, wound healing, and its regulation is compromised in cardiovascular disease and metastatic cancer. For two years, Ms. Galer served as the Department of Energy’s Office Director at the US Embassy in Islamabad, Pakistan and is being recognized for her outstanding contribution to international relations. In the role of Office Director, she worked diligently with various US agencies as well as domestic and international organizations to advance the US-Pakistan relationship and strengthen cooperation. Ms. Galer’s dedication and influence in the region will provide a strong diplomatic foundation for future collaboration. Ms. Gentry serves as the nation’s focal point for voluntary conversion to the metric system and, taking a multi-pronged approach, has led her program to multiple key successes. In her belief that the federal agencies should lead the way in introducing and using the metric system, she lends her expertise and leadership to federal agencies as they address metric conversion issues. Ms. Gentry has led a successful effort to persuade the states to amend their laws, regulations, and policies to permit manufacturers and retailers to voluntarily use metric units on their packaging. At the same time she has worked to ensure the laws of other countries continue to allow current US labeling while the transition takes place. She has also produced a broad range of educational materials about the metric system and conversion for the public-at-large, which has been enthusiastically received on all sides. Dr. Lauer has established new principles for management of a $1.7 billion program of basic, translational, and clinical cardiovascular research, playing a key role in setting the national cardiovascular agenda, and empowering his staff through creation of an active learning environment. He has pioneered use of streamlined results-based accountability in research decision-making using objective metrics, and has increased the value of large population-based studies by sharpening the focus on clinical outcomes. He has fostered research in neglected populations and neglected areas with significant public health and cost implications. Mr. Kang has handled hundreds of bid protests over federal contracts worth tens of billions of dollars, involving topics as varied as major weapons systems, information technology, healthcare service and Medicare/Medicaid reform, and counter-terrorism and security. He has guided important and difficult decisions on procurement ethics and conflicts of interest, and written landmark decisions establishing important precedents for the federal procurement community. Mr. Kang’s reputation is such that government and private sector attorneys, as well as contracting professional, rely on his bid protest decisions in complying with procurement statutes and regulations.